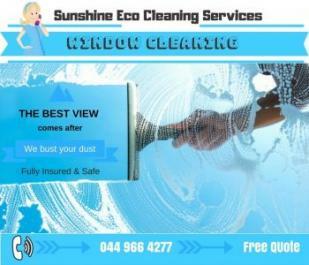 Sunshine Eco Cleaning Services is Sunshine Coast’s Number one leading provider of professional window cleaning services. Trained to achieve outstanding results, we provide a quality service for both residential and commercial clients, including transforming your tired windows, fly screens, frames and sills from grubby to new. Let our professional team take care of keeping your windows clean at a reasonable price. Our Sunshine Coast’s window cleaners can provide a professional service at an affordable price. We are fully insured for our safety and for your peace of mind. Hire our window cleaners who possess all the required skills, knowledge & experience to make your window sparkle. We provide full cleaning of glass from both sides. We clean the glass with soap and water. They are completely dried to ensure that no watermarks are left. For high rise buildings, we have special tools that help us to reach the most difficult places. Apart from windows, we clean balconies, mirrors, glass fences, window sills, panels and tracks using appropriate chemicals to avoid damages. We use the special stain remover to eliminate stubborn stains and blemishes. Be it the sloping window, lofts or staircase, we have the right tools and equipment to get the job done right. More Sunlight: This helps to kill bacteria and germs in the room. So, you can transform your home into a safe, healthier living space. Save On Light Bill. With more natural light coming in, you can save on the electricity bill. Increase the Lifespan Of Windows: Keeping your windows clean can increase their lifespan. With no dirt, the nuts and screws have free movement. This will prevent any breakdown. Remove The Stubborn Stains: Stains caused by rainwater and chemicals can be cleaned, keeping your windows looking beautiful. Unrestricted View: Clean windows provide you with a clear view of the world. Prevent Replacement: With a little investment in window cleaning, you can save money on a replacement. We will go that extra mile to make sure you get the best window cleaning services in town. We have the latest tools and adopt advanced technology to get the job done quickly and effectively. All window cleaners undergo three months of exhaustive training and test before they are assigned a project. We have complete knowledge of materials and are aware of various techniques to be used in different situations of window cleaning. Our windows cleaning staff members are background checked to ensure your safety and peace of mind. We only use quality products for window cleaning to ensure zero damage to the structure and environment. We work in your schedule and make every effort to minimize disruption to your routine life. In case of an emergency, we can provide same day window cleaning services at no extra cost. We encourage getting into a contract for 3 months, 6 months and yearly clean up. Whether it is window cleaning, house or offices carpet cleaning or some other cleaning chores, call 044 966 4277 to get a free quote! We will make your space look and feel sparkling clean and fresh. Experience the difference with our professional window cleaning services. Your best local window cleaners servicing in Caloundra, QLD. Receive free quotes from window cleaning specialist today. We are fully insured for damages. We are among the 3 best-rated businesses of 2018. Connect with the window cleaning specialist in Noosa, QLD. Contact us if you really want to hire professional window cleaners with great ratings. We are the end of your search for the best window cleaning services across the Sunshine Coast region. You can now enjoy clean windows that don’t block the sunlight as we make the way for the rays to reach you. Our window cleaners in & around Nambour, QLD also clean blinds, skylights, french doors, fly screens, & more. Sunshine Eco Cleaning Services is the best-rated window cleaning company across the Sunshine Coast region. We make your window sparkle with efficient, quality workmanship & professional window cleaning services. We are available 24/7 & offer one-off, annual or weekly cleans to tailor your needs. 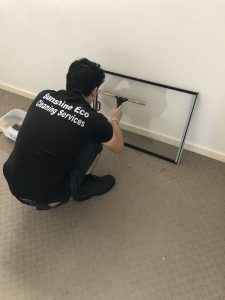 Sunshine Eco Cleaning Services provides quality window cleaning service with 100% satisfaction in Maroochydore & across the Sunshine Coast region. We have 12+ years of experience with 1000+ customers. Enquire now to get a free quote and we will beat any quote by 5%. All our window cleaners are professional, fully insured & offers safe cleaning. Sunshine Eco Cleaning Services is one of the top cleaning service companies in Australia. We offer eco-friendly cleaning services to residential and commercial buildings in the suburbs of Sunshine Coast, Caloundra, Noosa, Nambour, and Maroochydore. We make use of non-toxic and eco-friendly cleaning products to ensure our customer’s health. Our cleaners are well-trained and experienced to provide a quality window cleaning service and make your windows to shine. Our cleaning service includes exterior and interior washing, cleaning of window track and frames. We offer quick and safe cleaning services at a convenient time for customers. You can avail window cleaning service from us at a very reasonable price. As a result, you can enjoy clean and sparkling windows. The clean and shining windows in commercial buildings and residential buildings will leave a good impression on others. Customers also prefer going to clean and neat looking commercial establishments for business. But to maintain a clean window is a highly difficult task. For a dirt-free and spotless window in your building, you should opt for a professional Window Cleaning Service. Let us look down the reasons for hiring Professional Window Cleaning Service. One of the important reasons for hiring professional cleaners would be safety. To clean windows in high rise buildings need proper tools and training. Only the cleaning service companies with the latest tools and trained cleaners can ensure safety during the cleaning process. Since the professional cleaners are equipped with specialized tools and other cleaning products you can expect the best result with dirt-free and spotless windows all-year round. Even small cracks and scratches can damage the glass and that creates the need to replace the entire window panel. Regular cleaning and maintenance of the glass windows will increase its lifespan and reduces the risk of glass damage. There may be any damage or accident when you employ unskilled or amateur worker for the cleaning services. Whereas the professional cleaning service utility will take up the responsibility on their shoulders. They have insured professional cleaners and warranty to provide proper cleaning services. The cleaning service company should be equipped with the latest tools and cleaning products. Without proper cleaning products used it can affect your window’s glow and leave some stain on it. And that is why it is important to check with the products and tools they make use of. It is important to know that the company is licensed or not before hiring them. The professional cleaners must be covered by insurance policy. These are essential for a reputed cleaning service utility. By choosing a service company with proper documents protect your property in case of unexpected accident and damage. There are many cleaning services company which offers service at competitive prices. So it is necessary to compare with the prizes of several cleaning service companies and choose the one which offers a great job at a reasonable price.